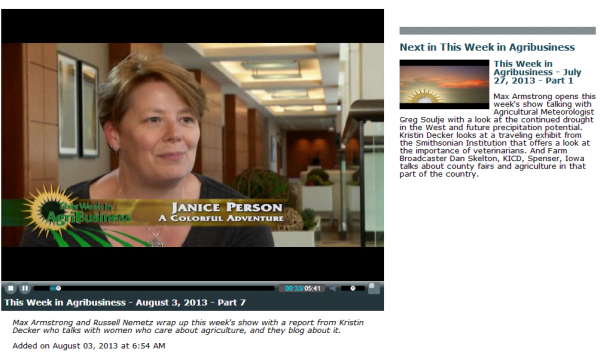 Check Out BlogHer 2013 meets This Week in AgriBusiness — You’ll See a Familiar Face… Mine! This weekend if you were watching “This Week in AgriBusiness” on TV, you may have done a double take as this blog was featured there alongside Katie Pinke’s The Pinke Post, Leah Beyer’s Beyer Beware and Aimee Whetstine’s Everyday Epistle. If you didn’t have a chance to catch it, you can watch Kristin Decker and Max Armstrong talk with us ag bloggers from the computer whenever you like! I always see things I could have done better but think the four of us did pretty good overall. This was after the fun lunch where all the ag women met up and just before we started our BlogHer 2013 experience! We were totally geeked up to talk about our blogs and Kristin Decker was so easy to talk to that we could have visited with her all day! This Week in AgriBusiness Needs You! Networking at BlogHer ’13 Really Means Lots of Friendly Faces!